This Upanishad is called Kena Upanishad, because it begins with the inquiry: “By whom” (Kena) willed or directed does the mind go towards its object? From whom comes life? What enables man to speak, to hear and see? And the teacher in reply gives him the defi­nition of Brahman, the Source and Basis of existence. The spirit of the Upanishads is always to show that no matter where we look or what we see or feel in the visible world, it all proceeds from one Source. It is also known as the Talavakara-Upanishad because of its place as a chapter in the Talavakara Brahmana of the Sama-Veda. the speech of the speech, the life of the life, the eye of the eye. after leaving this world, become immortal. There the eye does not go, nor speech, nor mind. we do not understand how can It be taught. and also It is beyond the unknown. who told us about It. not this which people worship here. or in what form He (resideth) in the Devas (minor aspects of Deity). that what thou thinkest to be known is still to be sought after. He who thinks he knows It not, knows It. He who thinks he knows It, knows It not. while the ignorant think they know It. when It is known in every state of consciousness. (Through such knowledge) one attains immortality. and by Self-knowledge immortality is attained. if one knows It not here, then great is his loss. being liberated from this world, become immortal. It was second part of Kena Upanishad. The Brahman once won a victory for the Devas. Through that victory of the Brahman, the Devas became elated. The Brahman perceived this and appeared before them. They did not know what mysterious form it was. They said to Fire: “O Jātaveda (All-knowing)! “I am Agni, I am Jātaveda,” he (the Fire-god) replied. He (Agni) rushed towards it with all speed, but was not able to burn it. “I am Vāyu, I am Mātariśva (traveller of Heaven),” he (Vāyu) said. but was not able to blow it away. but it disappeared before him. It was the Third part of Kena Upanishad. She (Umā) said: “It is Brahman. that it (that mysterious form) was Brahman. because they came nearer to Brahman. It was they who first knew this spirit as Brahman. and because he first (before all others) knew this spirit as Brahman. is here illustrated in regard to the Devas. and appeared and disappeared just as the eye winks. Next (the teaching) is regarding Adhyātman (the embodied Soul). The mind seems to approach Him (Brahman). remembers and thinks about Brahman. That Brahman is called Tadvanam (object of adoration). He is to be worshipped by the name Tadvanam. He who knows Brahman thus, is loved by all beings. The disciple asked: O Master, teach me the Upanishad. 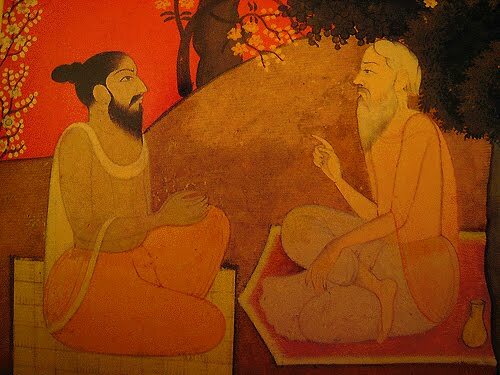 (The teacher replied:) The Upanishad has been taught thee. We have certainly taught thee the Upanishad about Brahman. karma (right performance of prescribed actions). The Vedas are its limbs. Truth is its support. in the highest abode of Brahman. It was the fourth part of Kena Upanishad.